The 15 Days Uganda Gorilla Safari Adventure Wildlife Culture Safari Uganda starts and ends in Entebbe Uganda. 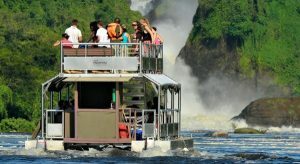 The safari takes you to the famous Uganda safari destinations including Ziwa Rhino Sanctuary, Murchison Falls National Park, Kibiro Salt Gardens, Fort Portal crater lake and Amabere g; Nnyinamwiru caves, Kibale National Park, Rwenzori Art foundation, Queen Elizabeth National Park, Bwindi Impenetrable National Park, Mgahinga Gorilla National Park and Lake Mburo National Park. These sites have got impressive wild game, culture and adventure safari experience making the trip worth undertaking. 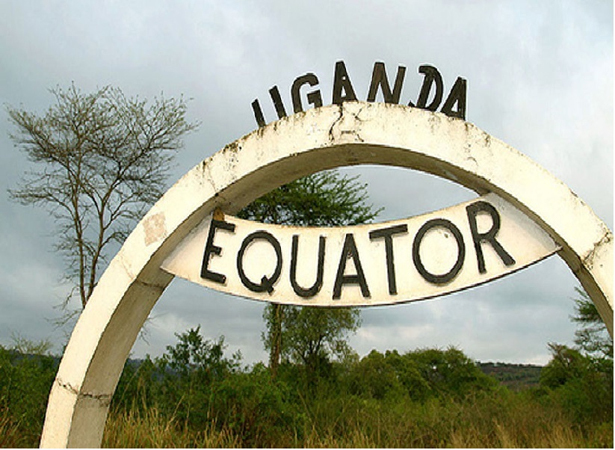 Depart from your country of origin and board a flight to Uganda landing at Entebbe International Airport which is apparently the main gateway to the country. You will find a company representative who will offer you a courteous welcome and transfer you to the lodge for relaxation, dinner and overnight. Transfer to Hoima after breakfast passing through the impressive scenic landscapes of Albertine rift. You make a stop at Kibiro Salt Gardens a site that has sustained the lives of the local people for 800 – 900 years back. The salt gardens are accessed by a narrow foot path which presents a challenging hiking experience. The shores of Lake Albert offer impressive views of the lake and the Blue Mountains of the Democratic Republic of Congo. 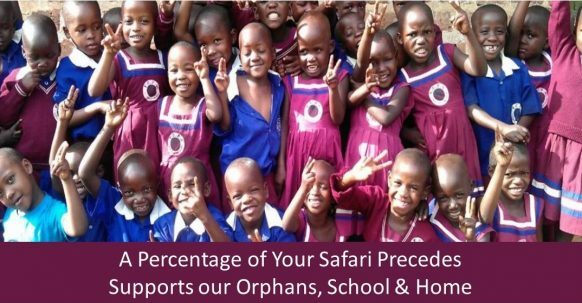 After the activity, continue on the drive to Hoima for relaxation, dinner and overnight. Transfer to Fort portal after breakfasts driving through impressive county side landscapes of Kagadi and Kyenjojo. You will arrive in Fort portal town in time for lunch after which you will connect to Fort Portal crater lake field and Amabere g’ Nnyinamwiru caves for a culture and adventure encounter. Exploring the Amabere caves which are beastlike features dating back to the ancient Chwezi era allows you to encounter the great history attached to it. You also hike the famous Kyeganywa hill gaining impressive views of the crater lakes and crater hollows in the area not forgetting the views of Rwenzori Mountains at a distance. Retreat from the activity and transfer to your respective lodge for relaxation, dinner and overnight. Gather at Kanyanchu Tourism Center at 8am for briefing about the chimpanzee trekking conduct. You head to the forest of Kibale which provides shelter to 13 primate Species including the chimpanzees. 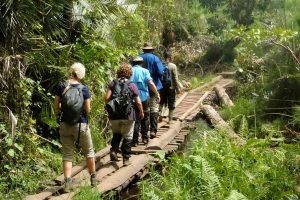 The hike through impressive forested landscapes of Kibale with lush forest cover filed with counts of birds and primates. The chimp trekking activity tends to last 2 – 5 hours with one hour of direct encounter with the chimps. You marvel at these species as the munch fruit, socialize, mate, patrol, hunt and make their pant hooting calls. You take as many photos for lasting memories and retreat from the activity and get back to the starting point for a short relaxation where you can also take your packed lunch. After this encounter, you transfer to Bigodi wetland sanctuary for an afternoon wetland walk. The walk through this eco community initiative exposes you to the impressive wetland ecosystem with swamp dwelling animals like Sitatunga and impressive bird species like the 2 – 5 hours and involves one full hour of direct Great Blue Turaco. The encounter tends to last about 2 hours. Transfer to Queen Elizabeth National Park 157km about 3 hours’ drive excluding stops en route. You make a stop at Rwenzori art foundation which is the only bronze casting center in Africa with remarkable sculpture aligned in the gallery ad offering you an opportunity to participate in the casting experience. Retreat from the activity and continue to Queen Elizabeth National Park to catch up with an afternoon boat cruise along the Paradise of Hippos. The boat cruise along the Kazinga channel offers you possibilities of encountering Nile Crocodiles and Hippos not forgetting water birds and a range of wild game That tend to draw close to shores to quench their thirst. Retreat from the 2 hour boat encounter and do a game drive along the channel track as you connect to the lodge for relaxation, dinner and overnight. Drive to the rolling plains of Queen Elizabeth National Park with its extensive savannah grassland for amazing game viewing experience after breakfast. The drive through the Kasenyi tracks enables you to explore a range of game including the elephants, lions, buffaloes, leopards, water bucks, side stripped jackals among other species. The activity tends to last 3 – hours after which you will return to the lodge for relaxation and lunch. In the afternoon, connect to Kyambura gorge for a thrilling chimpanzee trekking experience. The chimp trek in the valley of Apes as it is popularly referred lasts about 2 – 5 hours inclusive of one hour direct encounter with these apes. You hike the impressive gorge slopes with lush forest cover that surprisingly thriving below the sea level. In fact, Kyambura gorge is 100m deep. Coming across the chimpanzees as they forage, munch fruit, make pant hooting calls and socialize is very rewarding. Retreat from the activity and embark on the transfer to the lodge for relaxation, dinner and overnight. Gather at the respective park headquarters for briefing at 8am after which you will head to the mist in search of the critically endangered mountain gorillas. The hills of Bwindi and its deep saddles are soaked by dense forest cover with mature trees and thick undergrowth that have earned it the Impenetrable name. Hiking through these landscapes is very impressive too and a rewarding experience of its own. The activity tends to last between 2 – 8 hours inclusive of one hour direct encounter with these ancient apes. You marvel at them as they forage and socialize. Your pictures are the memorabilia that you can always look at to refresh the memories of this unforgettable experience. 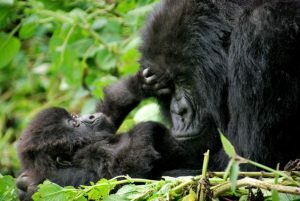 Retreat from the activity and transfer to Mgahinga Gorilla National Park for relaxation, dinner and overnight. 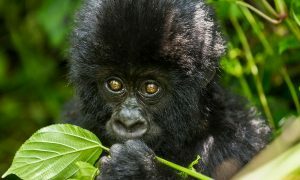 Embark on adventurous hike to any of the three Virunga Volcanoes that stretch to the Ugandan side. The three Volcanoes include; Gahinga (3,474m) followed by Sabyinyo (3,669m) and Muhabura (4,127m) which is the tallest of all. Since all these mountains can be summited on a round trip in one day, you select the most suitable and explore the beauty of the area. The peaks offers impressive views of the entire Virunga mountain chain with eight (8) Volcanoes spread in Uganda, Rwanda ad Congo. Retreat from the activity and transfer to Lake Bunyonyi driving through impressive scenic landscapes of Kigezi highlands and the Kisoro – Kabale Road which has the most scenic road section in the whole of Uganda., Arrive in Bunyonyi in the evening for relaxation, dinner and overnight. Accommodation: Birdnest @Lake Bunyonyi Resort (Upmarket / Luxury), Lake Bunyonyi Eco-resort (Mid-range / Standard) or Byoona Amagara Island Retreat (Budget / Basic). Depending on your departure flight time, you can first undertake a mini Kampala city tour to explore its impressive landscapes embedded in its historical, cultural, religions, education and economic sites.